Following the flavors starts when the grain arrives. “Grind it up and put some in your mouth. You’ll get an idea of the wonderful flavors.” And Mike suggests scooping some of the sweet mash into your coffee to taste the “wonderfully sweet liquid.” With a laugh, he suggests to the crew that perhaps they should start bottling it. Community is a big part of what Blackfish Spirits Distillery is all about. “We make what the community would like to have.” When requests came for a coffee liqueur, they worked with Café D’Arte coffee roasters in Federal Way. The Kirschwasser is a collaboration with the Swiss dairy farmers in the area who have cherries growing on their properties. The farmers get the by-products of the brewing mash for the cattle, and Blackfish gets the cherries. As slow distillers creating their own spirits, they control all the flavors in the spirits they produce. From the apples in the apple brandy, to the cherries in the kirschwasser and the cacao nibs in the chocolate liqueur, the flavors are intense. There’s no mistaking what’s in the bottles. The spirits and flavors span a wide range. “People think we’re crazy producing this body of work!” In addition to the whiskeys, gin, barrel-rested gin and vodka, Blackfish produces a wide variety of flavored spirits, ranging from cucumber vodka to coffee liqueur and a very local rhubarb liqueur. 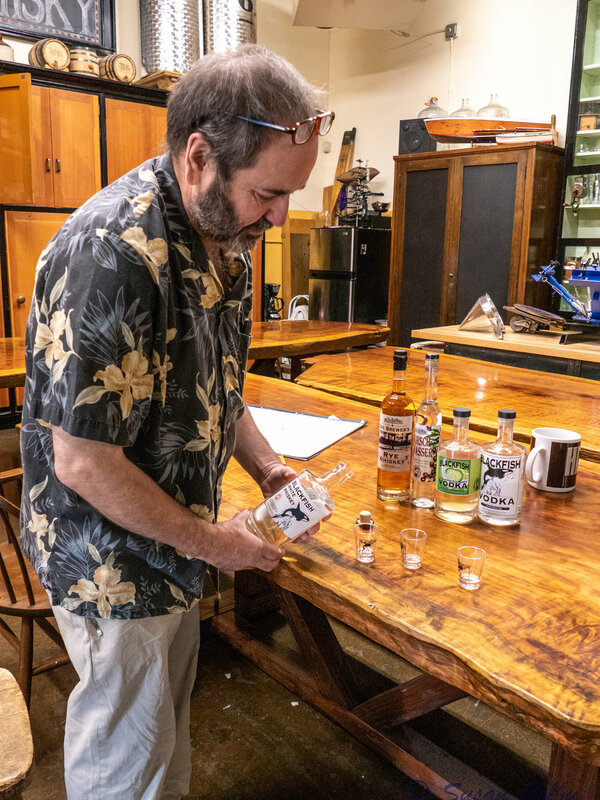 When creating these very distinct flavors, Mike often calls upon consultants in the food industry, including Chef John Hatcher of Café Pacific, who saved their bacon (or a batch of whishkey) when they were working on producing the popular Apple Pie Whiskey. Preparing the flavorings, including a gallon of freshly brewed vanilla essence, Mike asked John how much vanilla to use. Expecting to use the entire gallon he had prepared for the batch, he was amazed when they found just a few drops were all they needed. An expensive disaster averted. Author's note: A friend and I decided a shot of the chocolate liqueur poured over breakfast yogurt and granola is the perfect start to the day! And during the creation of the chocolate liqueur, while collaborating with Ronnie Roberts of Gosanko Chocolates of Auburn, the chocolatier kept sending them back again and again to add “more cacao nibs” until they reached the full-bodied flavor found in the liqueur.